We create free, relevant content so you can stay abreast of what we are working on and the important topics effecting your region today. It's your choice - Just click the boxes below to manage your communications preferences. PLEASE NOTE: if you leave a box unchecked, you WILL NOT receive emails about the topic. The Partnership Newsletter - The WIRE gives you a high-level view of our initiatives from events to advocacy initiatives to member news and everything in between. BN360 Newsletter - The region’s premier young professional’s group, learn all you need to know about this groundbreaking program. 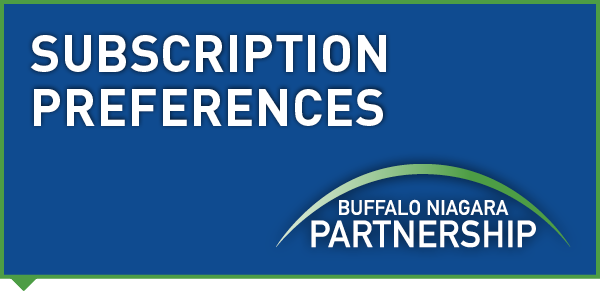 Employ Buffalo Niagara - Updates on how the Partnership is working to advance the state of the region’s workforce. Associate Member Newsletter - Updates and event information from our strategic partners, the Greater Niagara and Hamilton chambers of commerce.